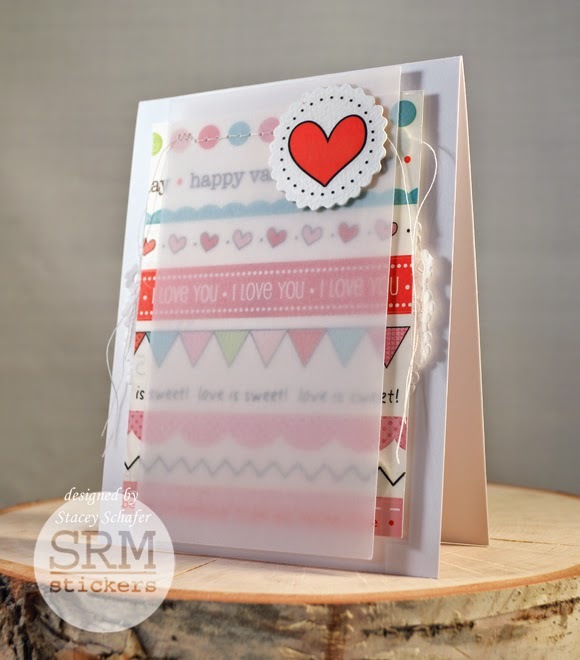 I'm up on the SRM Blog today with a trio of LOVE using some darling SRM Stickers products! 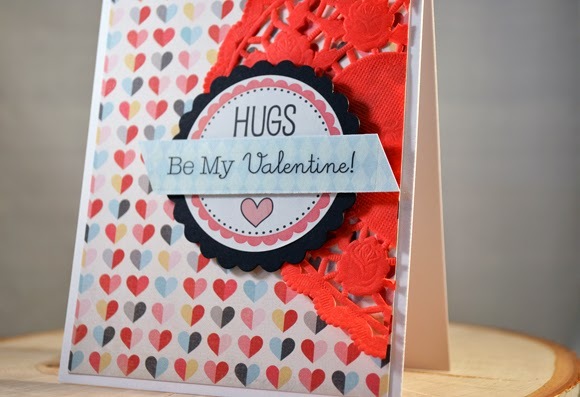 This first Valentine card was created using a portion of the Red 6" Heart Lace Doily for a textured background layer. 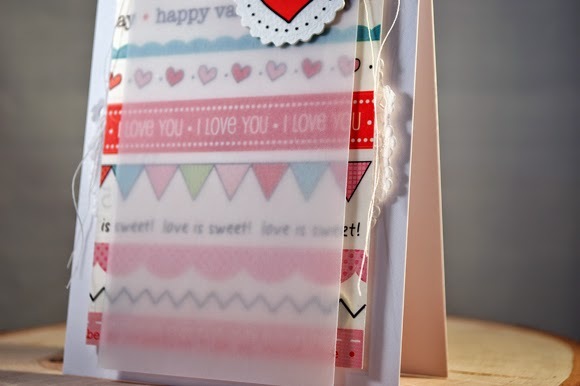 The Labels by the Dozen/Valentine sticker was adhered to one of the Large Scalloped Circle Punched Pieces and the Stickers by the Dozen/Valentine sentiment was attached to a piece of coordinating paper, then trimmed as a banner to complete the card front. This card was SO FUN and EASY to make! Do you ever have that lightbulb moment when crafting?! Well, I had a moment like that when I was staring at the adorable We've Got Your Border/Valentine border sticker sheet. I wanted to use the borders to create a subway-art effect, but why detach all of the borders from the sticker backing?! I simply trimmed down a piece of the border sheet, keeping the backing attached and...VOILA! It created a perfect and adorable background! I covered the sticker panel with a piece of vellum and stitched it up, added a White Small Scalloped Circle Punched Piece with a Stickers by the Dozen/Valentine heart sticker. There's a sweet 4" Round White Lace Doily tucked behind it all! Oh, how I love doilies! This last card was created using stickers from the We've Got Your Sticker/Sweet. I love that big "SWEET" sentiment that makes a bold statement to the one you love! The strawberry was adhered to a Red Large Scalloped Circle Punched Piece then adorned with The Twinery Red Shimmer Baker's Twine bow. 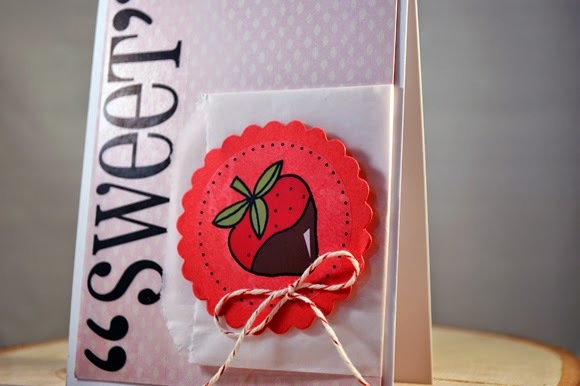 A Flat 2.75" x 4.25" Glassine Bag was folded behind the card panel to display the berry and add softness. 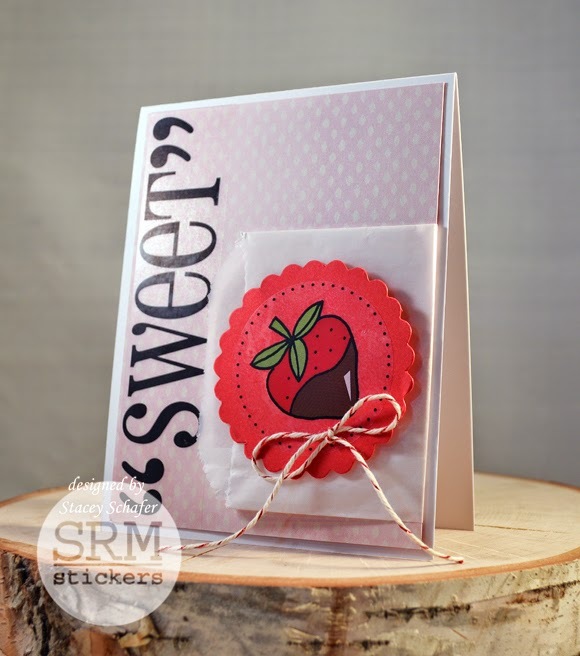 I hope you are inspired to whip up some Valentine cards using SRM Stickers! Lovin' all of your SRM projects Stacey! How GREAT are these! Love the dipped strawberry! Your cards are so sweet. Great Valentines cards for that special someone. All of your cards are just amazing Stacey! I love the vellum overlays! So pretty!